Home Baseball	Cardinals power their way to a 7-5 victory! Cardinals power their way to a 7-5 victory! On Tuesday night, the St. Louis Cardinals lost what turned out to be another great pitcher’s duel, this time, in extra innings. They fell to the Washington Nationals 2-1 in 10 innings after a walk-off home run by Yunel Escobar. The loss snapped a four game winning streak for the first-place Cardinals. Winning on Wednesday night would tie up the series. It was a match-up of two veteran pitchers: 36-year old John Lackey for St. Louis, and 31-year old Doug Fister for the Nationals. The game started with a solo home run by Matt Carpenter (his team leading 3rd on the year), to give the Cardinals the 1-0 lead. Fister would rebound by striking out both Jason Heyward and Matt Holliday, and getting Matt Adams to ground-out, ending the top of the first. Lackey would get the first two out, including a strikeout of Ian Desmond, but then Jayson Werth doubled to right field. One of the best young players in baseball, Bryce Harper, stepped up to bat next, and struck out, ending the inning. To start off the second, Jhonny Peralta and Jon Jay would ground out. With two outs, Yadier Molina would take a two-strike pitch and hit it into shallow left field in front of Werth for a two-out single. Kolten Wong followed with a home run to right field, which was his first of the season, to give St. Louis a 3-0 lead. Lackey would get a 1-2-3 inning, and after two innings, St. Louis maintained a 3-0 lead. Heyward, who entered the game with an average of .192, singled to lead-off the top of the third inning. Holliday grounding out would then send Heyward to second. Adams then got an RBI double as the ball was hit right down the left field line, barely staying fair, as the Cardinals took a 4-0 lead. With Jay up, that lead was extended after a misplayed ball by Ryan Zimmerman enabled Adams to score, Peralta to go to third. After a pop-out by Molina ended the top half of the inning, the Cardinals were up 5-0. But in the bottom of the third, the Nationals were able to get the bases loaded with one out, and a sac fly by Werth would score Fister. That cut the lead to 5-1. The bases would then load up once again, and an infield hit (Lackey did not cover first in time) would keep the bases loaded and cut the lead once again, this time to 5-2. Escobar would fire a double into left field, clearing the bases and tying the game at 5-5. Lackey would be able to get the final out, as both teams headed to the fourth. Wong would lead-off in the fourth with a single, and he would advance to second after a bunt by Lackey. However, he’d get caught stealing on his way to third base. Carpenter walked, and Heyward grounded out, as St. Louis came away with no runs. With the game still tied in the sixth, manager Mike Matheny took out Lackey, whose final line was as follows: five and two-thirds innings pitched, eight hits, five runs, five earned runs, one walk, four strikeouts, on 98 pitches. Kevin Siegrist would enter the game for Lackey, and finished off the inning. As for the Nationals, Fister’s night would end after six innings, seven hits, five runs allowed (four of them earned runs), two walks and three strikeouts. Matt Grace entered the game in relief for Fister in the seventh inning. The top of the eighth was when the Cardinals finally broke the 5-5 score. After a ground-out by Peralta, Jay walked, and Molina singled, sending Jay to third. 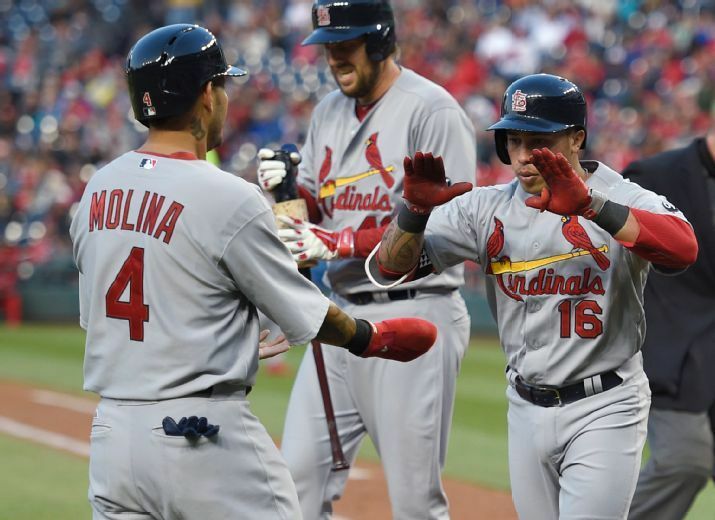 Wong, who all night both at the plate, and on defense, kept his hot streak going by doubling home Molina, and giving the Cardinals a 6-5 lead heading into the bottom of the eighth inning. Setup man Seth Maness then was called upon to pitch, and did his job, shutting down the Nationals in order, sending the game to the ninth inning. During the top of the ninth inning, Holliday, riding a 12-game hitting streak, struck out, ending his hitting streak, as he went 0-4 during the game. But the very next at-bat, Adams launched his second home run of the year, over the right field wall, to make it 7-5 Cardinals. Closer Trevor Rosenthal entered in the bottom of the ninth, with a two-run lead to work with. And after two straight strikeouts, Denard Span would pop out and the Cardinals would win, improving to 9-4 on the season. Tomorrow afternoon, in the final game of the series, Michael Wacha will face-off against Max Scherzer. Seriously? It’s Blues Hockey playoffs and archcitysports.com leads with baseball? I know “it’s a baseball town” and blah blah blah but this headline is exactly the reason I point out this sort of ridiculousness. That article was not posted until today Mick, long after I made that comment this morning. Glad to see archcitysports.com finally got on the puck. It was posted last night but looks like we dropped ball on publishing it. Nobody here talks about being a baseball town. Love the Blues just as much as the Cards and hockey just as much as baseball. Heck, we even started covering SLU hockey this past year.